Summer is on its way, and you’re planning a family vacation – or a quick escape from it all! Lush, warm and rich with culture, Belize is at the top of your list. So what do you need to know about planning a vacation to our Central American haven, and which parts should you visit? Summer in Belize is warm and rainy. Average temperatures range from 79°F to 86°F, and tropical rain showers are to be expected. Hurricane season falls between August and October, so if you’re booking flights around then be sure to invest in cancellation insurance – just in case. Summer is low season in Belize, so you’ll be able to beat the crowds and enjoy off-season prices. But there’s plenty going on in Belize during the summer months! Lobster season opens in June, and the major towns and cities host festivals to accompany it. In August Ambergris Caye hosts the International Costa Maya festival, an all-singing, all-dancing event celebrating ancient Mayan heritage. 75% of Belize is tropical rainforest. This summer, put your insect repellent and hiking boots on and head deep into the jungle. Arrive early in the morning to spot tropical birds like toucans and macaws. 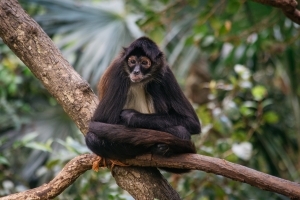 Howler monkeys, tapirs and dugongs abound; the keen-eyed may even spot a stealthy jaguar. There are also many Ancient Mayan ruins nestled in the jungle – Actun Tunichil Muknal and Xunantunich are some of the most famous. Perhaps we’re a little biased, but there’s no place like home. For us, that’s the 16-mile sandy stretch of the Placencia Peninsula. Home to some of the country’s most beautiful beaches and a laidback “barefoot” vibe, it’s the perfect pick for a relaxing getaway. Kick back on the sand, go for a paddle in the water, and indulge with incredible home-cooked food, desserts and tropical drinks. Plus you’ll be on the doorstep of incredible sights like Monkey River and the Cockscomb Basin Wildlife Sanctuary. Make the most of the ocean this summer. A stone’s throw (or a quick boat trip) from Placencia, Belize’s Cayes are a stunning introduction to island living. Also easily accessible from Belize City, Caye Caulker is a bohemian heartland, while Ambergris Caye is home to colorful, bustling San Pedro Town. There are plenty of outdoorsy activities to enjoy, including snorkeling the Belize Barrier Reef or going scuba diving in the famed Great Blue Hole. Keep an eye out around the Gladden Spit area for whale sharks – these gentle giants visit between April and June and are a must-see! Planning a summer vacation in Belize? 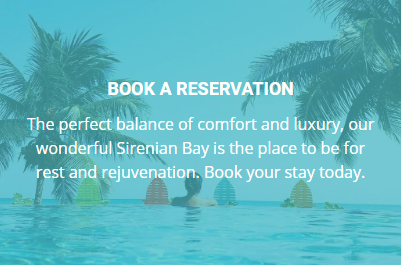 We’d love to have you at Sirenian Bay! Check your dates or drop us a line and we’ll help you plan the vacation of a lifetime.